Precision makes it possible to use materials that are difficult to machine. Glass is a very frequently used material today that is very difficult to machine on site. Entire facades are made of glass, but it is also used in interior design for large and often curved surfaces. Architects like to use the material in such a way that the fastening constructions have as little visual impact as possible. This requires a high degree of precision in the production of the components and assembly. Construction plans cannot be relied upon even for new buildings. The construction tolerances range from a few millimetres to several centimetres. Even if the construction was carried out correctly according to the plans, fixing points can be centimeters away from its position in the plan. This is all the truer if floor heights, the position of walls, doors, openings and fastening elements deviate from the planning. Precise prefabrication requires millimetre-precise geometric data of the real existing construction. They must be available in CAD planning tools and file formats. It’s hard for someone who doesn›t know the technology to find suitable hardware and software. 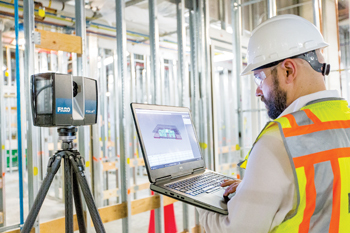 Laser scanning is just the first step in a workflow that will result in deliverables such as 2D plans and 3D BIM models or even the optical marking of construction mounting points or imperfections. The combination of the right hardware and software saves many hours of senseless work. Serial processing of steps that could be performed automatically in parallel (for example, scan registration), unnecessary data conversions, jumping between many programs and platforms, manual evaluations instead of automatic processes, days and weeks of useless work can be avoided by smooth, seamless workflows and the correct interaction of hardware and software. FARO offers optimised corresponding workflows. “Scanning itself is only part of the job, but an important one,” said Jörg Braunes, product manager at FARO. “The entire workflow depends on the quality of the measurements. This includes not only the precision of the 3D measurement itself, but also, for example, the inclination accuracy of the scanning device. If this not sufficient, the measured points won’t lay on the real object surface, or the registration of the scans can fail,» added Braunes. 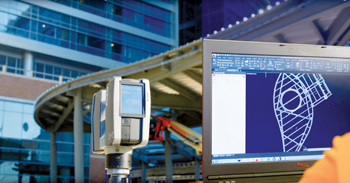 “FARO scanners measure on distance of 20 m to an accuracy of one to two millimetres. There are scanners on the market that have absolute measuring errors up to 18 mm at 20 m, values that are unacceptable for us,” he said. “With our on-site compensation functionality users can verify and adjust the scanner compensation immediately before scanning, ensuring high-quality scan data and traceable documentation” emphasised Braunes. The scan data are of excellent quality and small compared to those of other vendors. This is a prerequisite for handling large projects with several hundred scans. Completed scan projects can be uploaded to the FARO’s WebShare Cloud, where they are immediately available to project participants for measurements or further documentations. But scanning is only the first part of the workflow that converts real geometries into CAD deliverables such as AutoCAD and Revit files. “FARO has fast scanners and definitely the fastest and most seamless workflows currently available,” said Braunes. The individual scans must be aligned against each other. This registration process, which often takes hours up to now, is done with the FARO equipment directly on-site during the scanning process. The scans can not only be registered against each other “cloud to cloud” but also with the help of surveyed targets if needed. The final scan project is thus created on-site, reworking in the office is reduced to a minimum. Measurements and evaluations can be carried out. The FARO Autodesk plugins save a huge amount of time. They are fully integrated in AutoCAD- and Revit-based programs. Scan projects can be evaluated directly and conveniently in the Autodesk software itself to 2D plans and 3D and BIM models. The scanner data are a complete record of the scene. Without the need to visit the construction site again users extract needed dimensions, edges, corners and opening lines to determine total design space. They create traditional 2D floor plans, perform plane analysis on wall face for flatness assessment, generate elevation drawings in AutoCAD with accurate opening, edge and corner dimensions and analyses the depth of surfaces for wall and structure flatness. But on-site evaluations like floor flatness can also be very advantageous. FARO Quality Control Workflows with BuildIT Construction Software, for example, are so fast that concrete on the construction site can still be corrected in the curing state. Time is also saved in prefabrication and final assembly. With the Tracer projector, FARO offers a device that projects CAD geometry, assembly points or areas that need to be reworked onto workpieces. Good workflows are saving time and money. “We have many customers from the glass, facade and interior construction industries who use our technology. I spontaneously think of the Hutchinson Regional Medical Center (HRMC), that has renovated the intensive care unit. The center of the new unit was a circular staff area surrounded by large curved glass panes, from where the personal can see the patients in their rooms,” Braunes said. “The panes were very expensive and had to be prefabricated to fit exactly. Corrections during installation would have been very difficult or even not possible. Savings that would not have been possible without the precision and speed of 3D laser-based surveying technology and the associated workflows.